I have an iPhone application which has a storyboard. Now I want to provide an iPad application too. 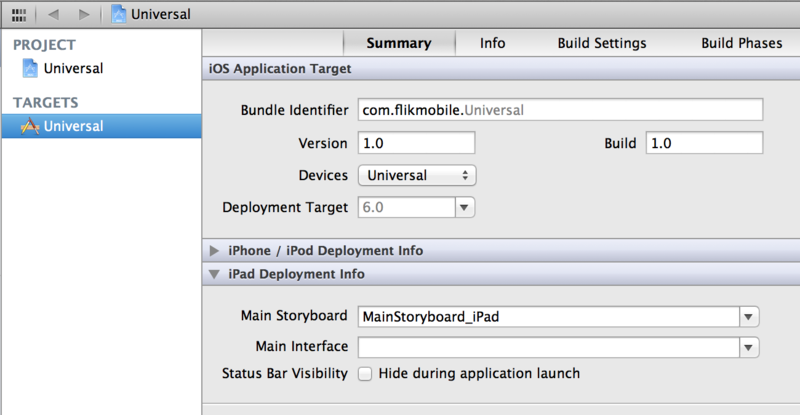 So I asked me whether there is a function which helps me convert my iPhone storyboard to an iPad storyboard. Is there a similar function or is there only the manual way ? Close Xcode and then open this file any text editor. Now save everything and reopen Xcode. The iPad-Storyboard has the same contents as the iPhone-file but everyting could be disarranged. If you had created a universal project, by default empty iPad storyboard would have been created, you just have to select iPhone storyboard select all (Command+A), copy (Command+C) and paste it on iPad storyboard. Make sure to move the entry point from the empty storyboard to newly copied storyboard before compiling. That didn't quite work for me. I did something a little bit different. That worked for me. I got a new layoutout with all my outlets connected, which alone saved me a few hours. 2.right click on the storyboard -> “open as” -> “Source Code”. 3.Search for targetRuntime="iOS.CocoaTouch"and change it to targetRuntime="iOS.CocoaTouch.iPad"
4.Now save everything and right click on MainStoryboard_iPad.storyboard “open as” ->"IOS StoryBoard" 5. you may also have to change your constraints. Thats all you have done. 4 - Save. Now reopen but using the interface builder. You will only have to re-arrange. This is going the other way, but I was able to do a select all & copy in my iPad storyboard (~35 scenes) and paste it into my iPhone storyboard. The scene sizes were automatically adjusted. I only saw two problems, I had to replace UISplitViewController (since it's only iPad), and the default background became transparent instead of gray (still working on fixing that properly, without manually setting the background for everything). EDIT: It seems the default background for UITableView in the Attributes inspector is rather strange. I had to manually set the background to "Group Table View Background Color" for grouped table views, and "White Color" for non-grouped table views. It then was displayed as "Default" (I assume since it then matched a hardcoded value). -- Actually, even easier, changing from "Grouped" to "Static" and back seems to reset the default color. Here's something that saved me hours and might help those of you with Python skills. I've been building an app for the last two months, focused on just iPad iterating the UX with the team. Today focused on building out iPhone version, followed the steps above (thanks!) but I didn't want to then have to resize all the ui elements from iPad dimensions in the visual storyboard editor. So I wrote this little python jig script to scan through the storyboard file for x, y, width, height and scale everything down by by ratio 320./768. Allowed me then to just focus on fine adjustments. Run the script below with the copied storyboard filename as the first parameter. Go to your Target Summary and change devices to universal, then go down and set the ipad version to any storyboard you like including a copied and renamed one if you like. The storyboard content copied over nicely to a new board file I added. However, it would not put changes over to my provisioned iPad. Noticing that I had to switch over the designated storyboard for the build target (see image) let the changes show. Project navigator on the left side source menu, root target of project (center pane) general tab, (second subhead) deployment info, with the iPad button tab selected. From there, choose your storyboard under "main interface." Thanks for the post, I hope this mention helps a snag somewhere. Using the XCode6 Size Classes you no longer need to convert the storyboard to iPad. The same Storyboard can be used for both the iPhone and the iPad, saving you from keeping two files up to date. The resulting storyboard is compatible with iOS7+. Use size classes to enable a storyboard or xib file to work with all available screen sizes. This enables the user interface of your app to work on any iOS device. For Xcode 5.1, I had to do some cleanup of iPhone storyboard like missing reuseIdentifiers of Table cells, provide story board id for every controller, remove unused scenes. Using vi editor - changed targetRuntime="iOS.CocoaTouch" to targetRuntime="iOS.CocoaTouch.iPad"
Changed the Deployment devices to Universal - Chose the option of NOT copying the iPhone Storyboard. Xcode will default the Deployment Target to 7.1, took care of the deprecated functions. To fix the misplaced view error in iPad Storyboard - Changed the Frame Layout for Controllers giving errors. That was it.. Thanks all for your help.. The easiest and most reliable way to do this is to copy paste from your iPad storyboard. Create a new storyboard and name it something like MainStoryboard_ipad. Make your app a Universal app by setting the Devices property to Universal on the Summary page of the Target properties for your project. Open your iPad storyboard and paste. You'll have to go about resizing, but it can be faster than recreating the whole storyboard. There is a really simple solution for Xcode versions that support size classes (Tested in Xcode 7 which is the current version at the time of writing). Check the "use size classes" checkbox on a storyboard file (File Inspector), confirm that dialog that appears. Then uncheck that same checkbox - Xcode will ask you if you want to use this storyboard with an iPhone or iPad, and convert the screens in it appropriately. No need to directly edit the storyboard file. For both iPad and iPhone, just copy the same storyboard and configure one for iPad and one for iPhone using the described method. Change the Class to the Class of your first ViewController used for iPhone, "fooViewController"
Thanks for the answers everybody. I followed the above steps but when I ran the app under the simulator or my iPad it kept on just using the iPhone storyboard. Not the answer you're looking for? Browse other questions tagged iphone xcode ipad storyboard or ask your own question. Converting iPhone xib to iPad xib? Converting iPhone app to Universal, XCode 5.1 and Storyboards. Bug? Creating IBOutlet to custom UIButton subclass from separate Phone and Pad storyboards?